Connect your gardening hose in a snap! 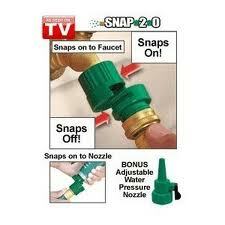 Snap 2.0 As Seen on TV makes connecting and disconnecting your garden hose, well...a snap! Simply attach the first of the 2 piece connectors to you faucet spout and one end of the gardening hose and the second to the other end of your gardening hose and your watering tool. Now your ready to quickly slide and lock the connections together. Snap 2.0 prevents leaks and drips coming from the connection points. Snap 2.0 literally just snaps on so no more screwing on hoses, faucets or watering tools and there are no buttons or rings to push.